I’m usually an aggressive early adopter of new gadgets, but I’ve not been able to bring myself to buy an e-book reader yet. This is mostly due to the DRM deployed by Amazon, Sony etc. and the consequences that has for how I would use the books and what would happen to them in the future. As I commute almost every day, and travel frequently when I’m not commuting  then I like the idea of being able to cart a bunch of books around with me in a consistent, light weight package. I do however tend to be a read once sort of guy. Books accumulate in my life. I’m barely getting started on the books that were bought for me last Xmas, and the mince pies are already in the shops for this year – yikes. I don’t anticipate a time when I’ll have the luxury to go back and read books again. When I’m done with books I tend to be a hoarder, but I also like to lend them out to friends. This is the one difference for me between books and videos – both I tend to use once then move on, but books get passed on, videos don’t; that said, the ideal distribution model for both would probably be a giant library in the sky, with some local cache of stuff queued up for those times that I’m offline (which I tend to be when I’m consuming books or videos) . Details on what B&N are(n’t) doing with DRM aren’t clear yet. One might hope that they’re driving an open format, and trusting their users to do the right thing, but I doubt this will be the case; I expect that they’ll simply have an even more elaborate DRM scheme that somehow supports lending between devices. Will this now mean that I can recall a book from a friend without having to see them? Can I check first whether they read the book yet or not? 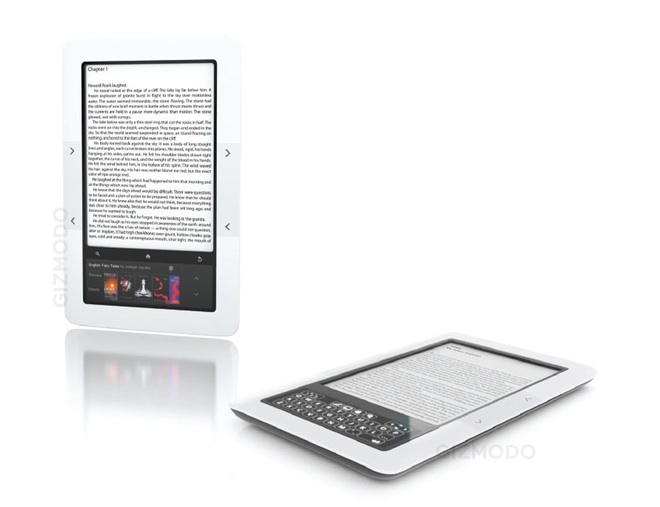 Anyway, this seems on the face of it to be less evil than the Kindle, and also looks sexier. I particularly like the look of the touch screen/keypad thing. I’m told by regular e-book users that Kindle usage (particularly if it’s in a leather cover) seems to be OK on the bits of flights when you’re not allowed to use other ‘approved electrical devices’. I wonder if the airlines will formally accept this or clamp down as e-books become more popular. One of the main reasons I normally have a chunk of dead tree in my bag is to have something to keep me occupied when the netbook and iPod are verboten. There’s probably some underlying marketing point lurking here. If I was paying to rent a book rather than buy it outright then I’d likely be more open to living with DRM and other content management malarkey; though obviously the price point would have to reflect that (I’m thinking £2-4 to rent versus £5-15 to buy).